To go along with the Chia Seed trend this week, i decided to make a Chia Seed Pudding from Giada De Laurentiis. This pudding has to be refrigerated overnight to form. 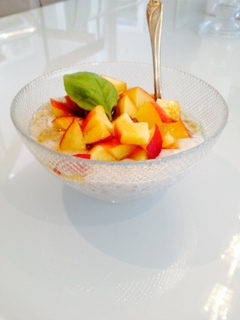 i added sliced peaches, but you can add any type of fresh fruit you like. In a bowl whisk almond milk, greek yogurt, maple syrup, sea salt and vanilla extract. Mix in chia seeds and let stand for 30 minutes. Place pudding covered in fridge overnight. In the morning take pudding out of fridge and place some in a bowl. Slice peaches or any other fruit you desire with agave or maple syrup on top.Enjoy!